People considered the price of this ashwagandha to be affordable. A couple of users mentioned the tablets were chalky and quite large. Garden of Life mykind Organics Ashwagandha is made by one of the most trusted supplement brands in the USA currently. The active ingredient formula is spot on, however the extra added ingredients in the tablets may be off according to a few users. This products quality and ingredient score does suffer a bit because of these added ingredients but we don’t believe its a total deal breaker. This product is still new to the market and has yet to bring in a lot of users but you can find it in basically every health food store, including Earthfare and Wholefoods. Despite the comments on its extra added ingredients, many still love and trust the Garden of Life brand to provide them with their dose of ashwagandha. One serving of Garden of Life mykind Organics Ashwagandha Stress recorded 600 mg of ashwagandha root extract containing 30 mg of withanolides (5%). 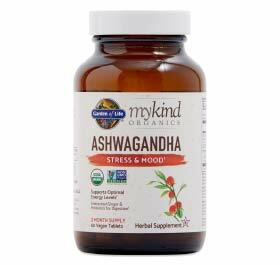 Overall, Garden of Life mykind Organics Ashwagandha does pretty well in every section of our review. Ingredients are good, effectiveness is there, and quality is top notch. We give this product a 4.5 out of 5 (4.5/5) only because the extra ingredients may be off putting to some users. Thus it receives a penalty as we are not even sure why Garden of Life went with this formulation. Overall this product passes our ingredients rating pretty easily. Although it does bring in some extra ingredients, they are of organic quality. No real red flags and far better than 90% of the ashwagandha market. Other Ingredients: Clean Tablet Technology Blend: Organic Gum Arabic, Organic Dextrose, Organic Coating (Organic Tapioca Maltodextrin, Organic Sunflower Lecithin, Organic Palm Oil, Organic Guar Gum). Research Suggests a root powder or a root extract containing, respectively, at least 0.3% and 1.5% of withanolides — key marker compounds which may also play a role in the herb’s activity. Typically 10 mg to 30 mg of withanolides per serving. One serving of this product recorded 600 mg of ashwagandha root extract containing 30 mg of withanolides (5% concentration). This product passes our quality review, although it does use additional ingredients in its tablet formula, it does use organic quality ingredients all the way through. This brand is well known and can be easily found in basically every store. If an issue were to arise you would easily be able to contact them.